Motherhood is a wonderful experience, but there are moments when we all need some good advice and look to the experts for reassurance that we are making great choices for our kids. A good book can ease our minds, put a smile on our faces, make us laugh and cry with abandon, and give us some much-needed practical information. The five books described below are essential for the Solo Mom. They just might help you survive the trials and tribulations of parenting. Best book to read when you would normally reach for a martini, but . . . you’re pregnant. Most parenting books can make us feel like we are going to fail at everything as parents. “How can I, as a Solo Mom, be on top of all the demands of creating an impressive human being?” I find myself asking that question on a regular basis. With all the stress of worrying about our little ones, we frequently feel inadequate. Sometimes, a little bit of humor takes the edge off. Pregnancy is especially full of what-ifs and worries. Hatched! The Big Push from Pregnancy to Motherhood by Sloane Tanen (Bloomsbury USA, 2007) is a hilarious and witty account of pregnancy and motherhood, wrapped up in ridiculous cuteness with “signature chicks” and one-page tableaus. It will take you through the most embarrassing, awkward, and just icky parts of pregnancy and childbirth, and help you find some humor in it all. Sleep deprivation, anxiety, competition, and postpartum issues all find their way into this clever book. Make sure to grab a tissue to dab your eyes because the laughter will leave you more relaxed and make you forget about that martini. Ready to cry? Feeling like you don’t know up from down right now? You are not alone. Sleep deprivation is a real problem, and it will be at its worst during the first weeks of your newborn’s life. Your body is also coping physically following the recent birth of your baby and maybe a C-section or other matters. Your baby’s many feedings are keeping you up at all hours, and it’s likely your baby is sleeping at all the wrong times. Don’t fret. This is normal. Before you go any further down this path, get some trusty support from Marc Weissbluth, MD, in his book Healthy Sleep Habits, Happy Child (Ballantine Books, 1999). Weissbluth is an expert in preventing children’s sleep issues from infancy through adolescence. His book is easy to read with step-by-step guides to create structure and support for every baby and parent. Get on top of your child’s sleep cycles before you create years of sleep deprivation for you and your little one. To puree or not to puree? The newest trend in baby food is “baby-led weaning.” Originally, when I first heard the term, I thought this meant weaning from breastfeeding, but I was wrong. It is actually all about babies transitioning to solid food and skipping the purees. 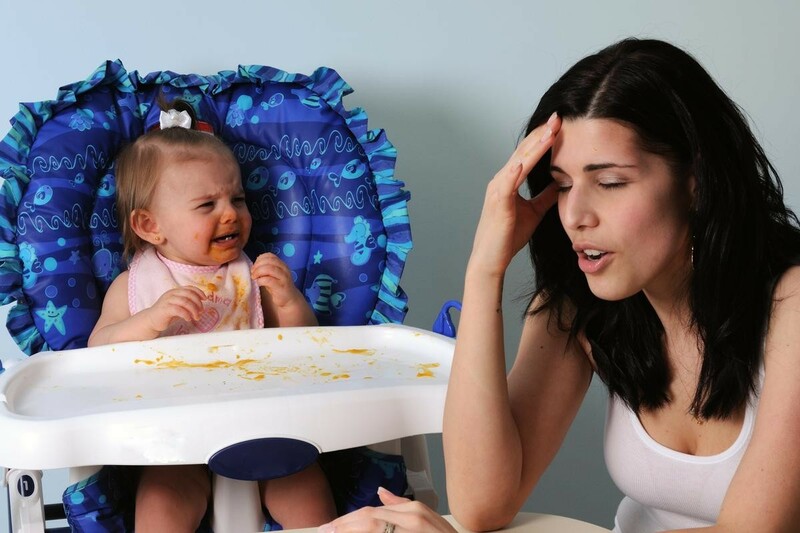 Baby-Led Weaning by Gill Rapley and Tracey Murkett (The Experiment, 2010) explores why babies do not need to be spoon-fed and teaches parents how to read their child’s cues from around six months of age, helping the child join in at the family table. Baby-led weaning is fun and downright messy, so get ready with your dustpan and vacuum. Starting in the UK, the fast-growing trend to introduce solid food earlier has led many parents to ditch their hand-held immersion blenders, opting for hand-held food during mealtimes. Jamie Glowacki wrote Oh Crap! Potty Training: Everything Modern Parents Need to Know to Do It Once and Do It Right (Touchstone, 2015) to help every parent through this big moment. If you have a child who is between the ages of 20 and 30 months, this is your window of opportunity, says Glowacki, who is positive that after this age, potty training just gets harder. You want to harness the “pleasing” power of your youngster and his or her need for more responsibility at this age, so start potty training with a vengeance. Her best piece of advice to parents when sharing this stepping-stone: Never post anything on social media about potty training. You will get an overwhelming amount of unsolicited advice, and when your potty training doesn’t go as planned, be prepared for the “I told you so” responses in epic form. Note to self right now. Glowacki’s book is common sense. Busy Solo Moms need potty-training advice that works. There is no gimmick, nothing to buy, nothing to confuse you—just good, old-fashioned advice that has been tested and is tried and true. To start, you will want to check off Glowacki’s criteria for readiness, which include singing the ABC’s, communicating needs, and a great one: throwing a tantrum! If your little one is on point, it’s time to begin. The first day you begin potty training, put your phone away and get out some paper towels. You are going to let your child run around naked and watch for pee signs. Now, you will need to catch your child and put him or her on the potty, and watch out for your rugs and couch. Maybe stick to a part of the house that you can easily clean up if you do not want to buy new furniture during this training time. Glowacki says that for this to work, you will need to be entirely focused on your child. There are many more steps, and you will have a lot of setbacks—that is normal. Glowacki clarifies that this is not a method. Only you know your child best. Glowacki has collected a lot of wisdom to help you, but you and you alone will be the ultimate support to help your child move on to success in using the potty. Glowacki repeatedly reminds you that there is no timetable and not to prompt your kid to go to the potty. Doing so will only bug your child and cause your child to resist. A lot of parents admit that resisting prompting is the main part of the advice that is hard to commit to. It is our idea of failure that gets in the way. Why haven’t we moved forward to the next part? Why isn’t this going faster? Let your child guide you. It’s not going to be a smooth ride; there will be mistakes, and it’s going to take time, probably on and off the potty. Some good news? With your purchase of the book, you get access to Glowacki’s forum, so you can commiserate with other parents, find some comic relief, and share your potty-training stories. Don’t fret. Oh Crap! Potty Training will have you shopping for toddler underwear in no time! Need a time-out from your toddler? Tantrums, tantrums, tantrums! Toddlerhood is full of exploration, giggles, and mushy kisses until, in a split second, your little one turns into a monster before your eyes. Now your days are filled with moments such as peeling your child off the sidewalk during a meltdown, missing keys, broken phones, and an incoherent screaming session at the dinner table. Bunmi Laditan wrote Toddlers Are A**holes: It’s Not Your Fault (Workman Publishing Company, 2015) just for you. This mother shares her witty knowledge for parents with children aged one to three. Her motto, “Laugh, so you don’t cry,” will get you through the messiest of moments and the most hair-raising screaming sessions. Laditan covers feeding your toddler, potty training, “how not to die inside,” taking your child to a restaurant, and surviving the holidays. Her section on “Things You Thought You’d Never Say That You Now Say As a Parent of a Toddler” has a laundry list of quotes that will make you laugh and remind you that you are not alone in the zany world of raising a toddler. These formative years require patience and a large dose of humor and wit. This book will be your constant companion during the terrible twos and beyond.